To provide (someone) with a good reason for wanting to do something. The beauty of that question is that yes it’s true, which means that there is perfect agreement between the sales person and their manager on doing whatever is necessary to win. The problem is that since salespeople are so focused on closing deals they often lose sight of staying focused on the daily activities needed to be successful in the long run. A salesperson may fully understand that they need to prospect to uncover sales opportunities that they can close next month or next quarter, but when they get busy on client calls trying to close deals and sending out proposals it’s easy to slip on prospecting. This struggle to prioritize doing the right things day-in-and-day-out isn’t some whacky way that salespeople operate. It’s how most humans operate. For example, consider this question… “If I really want to be healthy and live a long life, wouldn’t it be logical that I consistently eat well, exercise daily and effectively manage my stress levels?” Get it? Just like salespeople, you know what you need to do — so why don’t you do it? 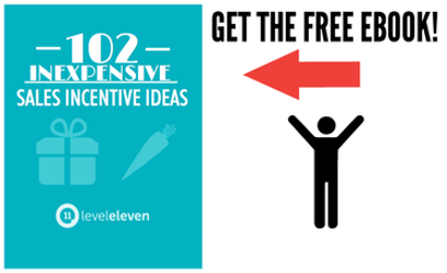 When you think of “incentive” the natural reaction is that it needs to be monetary. As you can see from the definition, there’s nothing there about a compensatory award. It’s all about motivating a behavior. Going back to the healthy living analogy, if you are a user of Fitbit, think about how that’s affected your behavior. Simply having access to the data on how many steps you’re taking is the incentive you need to want to take more steps than you did before you got that Fitbit. You already knew that you needed to move your body, but Fitbit gave you the insight you were missing. This same concept applies to sales. While lots of people are competitive, as a ratio you’re going to find a high proportion of salespeople that have that competitive fire. As a result, they will react very strongly to an opportunity to find out how they can get better. This may be by showing them where they stand relative to a target, or how they are performing relative to their peers. If you are trying to motivate a behavior, you need a way to measure it, which often then results in some type of ranking system or leaderboard on how people are doing. For example, maybe you want to motivate your salespeople to move more sales opportunities to the “commit” stage. A great way to motivate this is to show a stack ranking of how many people are doing this effectively. As soon as a salesperson sees that leaderboard, they can see which of their peers may be doing better than them. While no competitive person likes to see other people higher than them on a ranking, today’s younger workforce looks at that as an opportunity to go learn from someone, which creates the in-team collaboration that so many companies desire. Whenever you announce a special area of focus, it gets the entire sales team to turn their heads to understand what’s going on, and then they’ll shift their behavior slightly toward that behavior. Just by announcing that there is an action or behavior you want the team focused on, you incentivize salespeople to shift how they spend their time. When a team is working to collectively focus in a certain area, say to get a certain number meetings in a given week, it creates something for the team to rally around. There is instant energy, excitement and camaraderie that kicks off within the team — and it’s all directed toward the behavior you want to see happening more often. While so far we’ve talked about not thinking of an incentive as the monetary part, it sure never hurts to have a reward. Sometimes the reward can be recognition at the team meeting that someone did a great job. If you can add a small like a gift card, a dinner at a nice restaurant or even a simple trophy for bragging rights, it’s a nice touch to make victory even more tangible. Here’s a great case study on how Kelly Services doubled quality client meetings and generated $5.8 million in incremental sales, with a reward of a $50 gift card to Starbucks. As you’ll read, and can probably guess, it wasn’t about the gift card. It was about everything else referenced above. There are lots of ways that sales incentives can work within your team, but don’t forget: Motivation doesn’t come from the monetary reward — it comes from within. Sales incentives are an important part of motivating a team to perform, but making them work is about a lot more than just the money.